Thanks to Dr. Ankur Sangoi, El Camino Hospital, Mountain View, California, for contributing this case and Dr. Hillary Zalaznick for writing the discussion. To contribute a Case of the Week, first make sure that we are currently accepting cases and follow the guidelines on our main Case of the Week page. (1) Many visitors have indicated that they get better searches when using Google.com to search our website, compared to the Search on our website (which is also from Google). They first visit Google.com, then type PathologyOutlines.com and the search term (for example "Pathologyoutlines.com carcinoid"). (2) Bookmark and use our Amazon.com link to remember to shop at Amazon.com, and at the same time, help PathologyOutlines.com. Even if you are an Amazon Prime member you can use our Amazon link to make your purchases and still have all the benefits of your Prime membership! (3) You can view a list of the latest Textbook updates and topics with new images here. 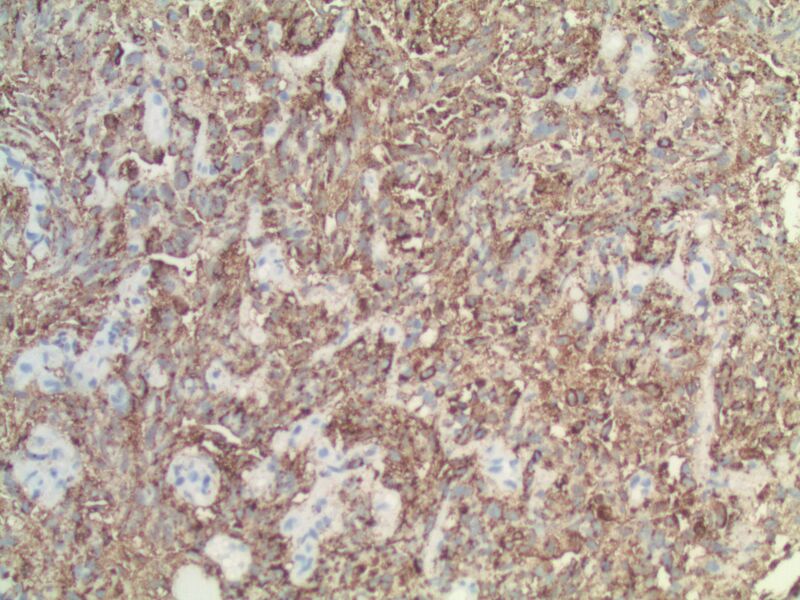 A middle aged woman with a history of lung carcinoma presented with a single cerebellar mass, which was excised. 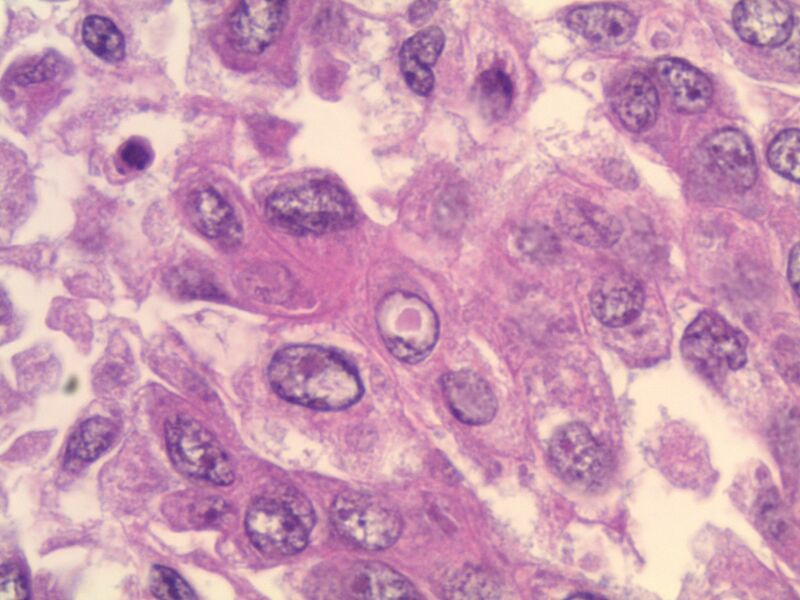 Which of the following histologic features is specific for ALK+ NSCLC? ALK gene rearrangements (ALK+) in non-small cell lung cancer (NSCLC) were first described in 2007, and are thought to be present in approximately 3-7% of NSCLCs (Clin Pharmacol Ther 2017;101:625). Patients with ALK+ NSCLC tend to be, on average, about a decade younger than patients without ALK rearrangements (ALK-), and also may be lighter smokers or non-smokers. They tend to present at more advanced stages (Cancer Med 2017 Apr 4 [Epub ahead of print], Am J Surg Pathol 2011;35:1226). Brain metastases are more common in ALK+ patients (as seen in the current case); however, pleural effusions seem to be less common (Cancer Med 2017 Apr 4 [Epub ahead of print]). Studies have identified the "solid signet-ring" and "mucinous cribriform" patterns as most characteristic of ALK+ NSCLC. As the name implies, a solid signet-ring pattern demonstrates signet-ring cells growing in solid nests and sheets. 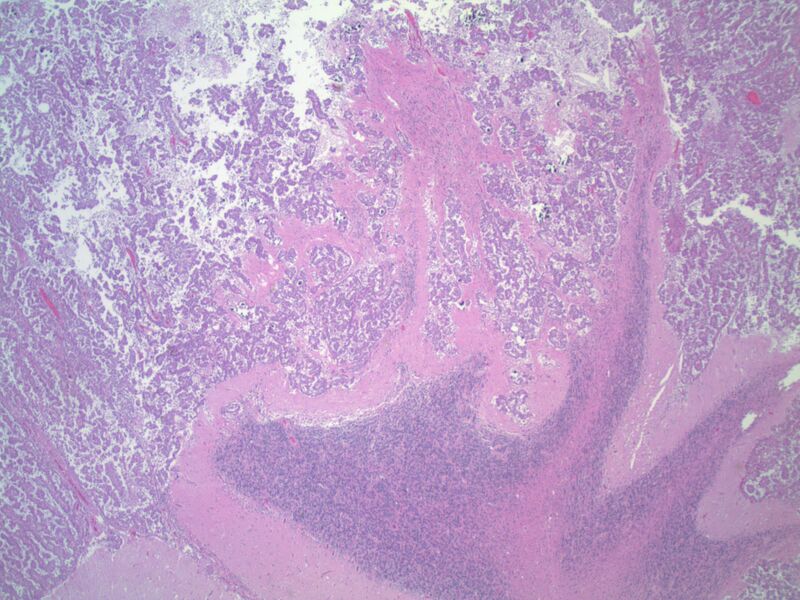 "Mucinous cribriform" refers to cribriform growth of tumor cells and abundant extracellular mucin, often with psammoma bodies and micropapillary clusters present within the mucin (Am J Surg Pathol 2011;35:1226). 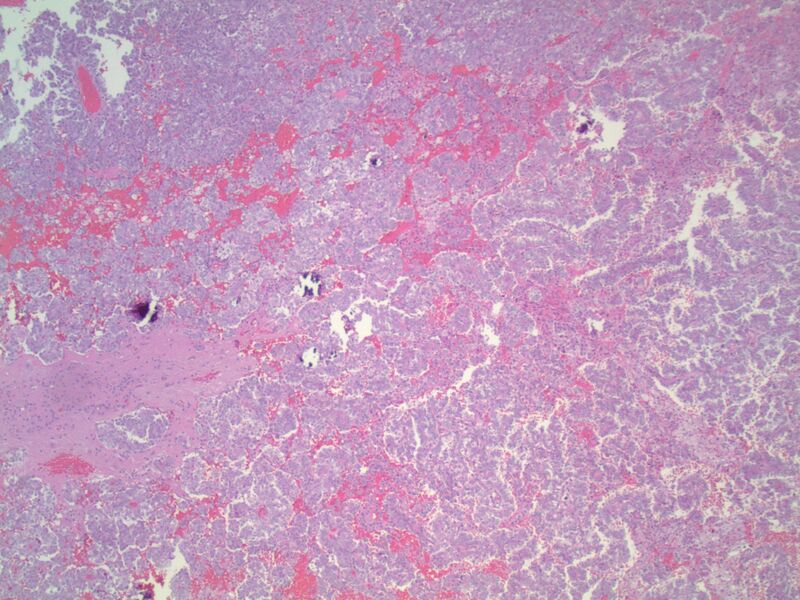 Papillary/micropapillary architecture and psammoma bodies can also be seen without a mucinous cribriform pattern. On cytology specimens, signet-ring cells and psammoma bodies are more commonly seen in ALK+ NSCLC compared to ALK- (Cancer Cytopathol 2015;123:162). 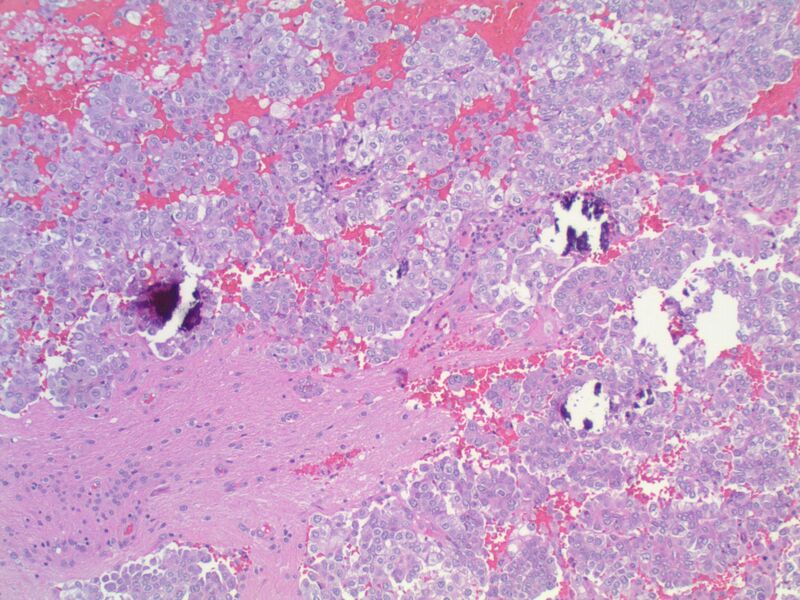 Nuclear grooves and pseudoinclusions similar to papillary thyroid carcinoma may also be seen (J Pathol Transl Med 2015;49:310). The histologic patterns in metastatic tumors are typically very similar to their primary tumors (Am J Surg Pathol 2011;35:1226). 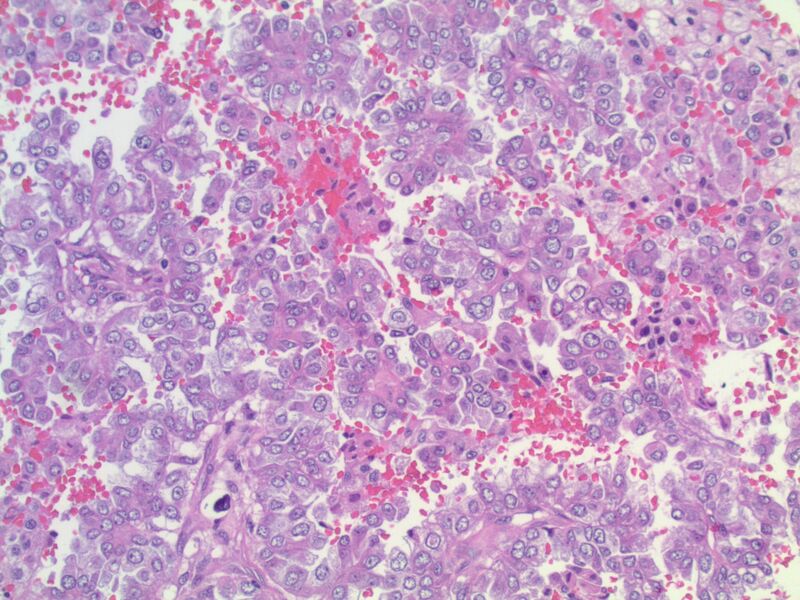 This patient’s tumor demonstrates several histologic features associated with ALK+ NSCLC: adenocarcinoma with papillary/micropapillary architecture, mucin production, nuclear grooves and pseudoinclusions, and psammoma bodies. Of note, however, none of the previously described features are specific for ALK+ NSCLCs, and ALK rearrangements can be seen in adenocarcinomas with other histologic patterns. ALK rearrangements have also been identified in mixed tumors – for example, adenocarcinoma mixed with sarcomatoid carcinoma, and adenosquamous carcinoma (Am J Surg Pathol 2011;35:1226). For this reason, the expert guidelines recommend testing adenocarcinomas of any histology, and any mixed lung cancer with an adenocarcinomatous component. 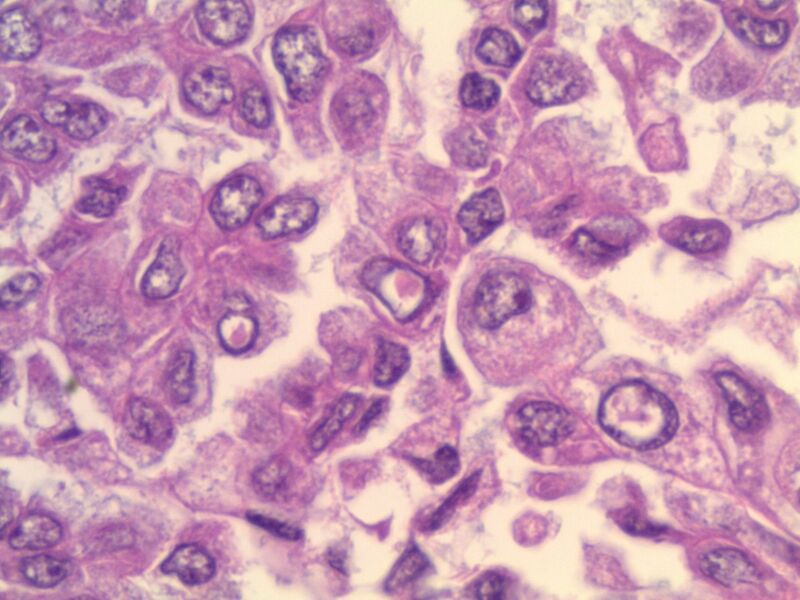 Small biopsy specimens showing only squamous carcinoma or small cell carcinoma may also be tested if the clinical history is supportive, because there may be an unsampled adenocarcinomatous area in the tumor (J Thorac Oncol 2014;8:823). There are several ways to test for ALK rearrangements (CAP Lung Biomarker Reporting Protocol). 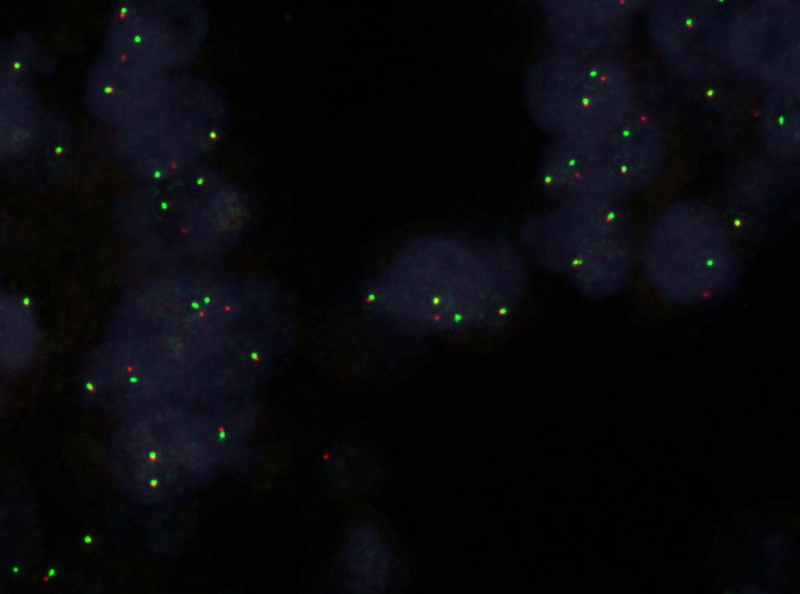 When crizotinib, a tyrosine kinase inhibitor that inhibits ALK, was approved in 2011 for the treatment of later-stage ALK+ NSCLCs, a commercial FISH dual-labeled break-apart probe was approved as the companion diagnostic. This FISH assay is currently considered the "gold standard." 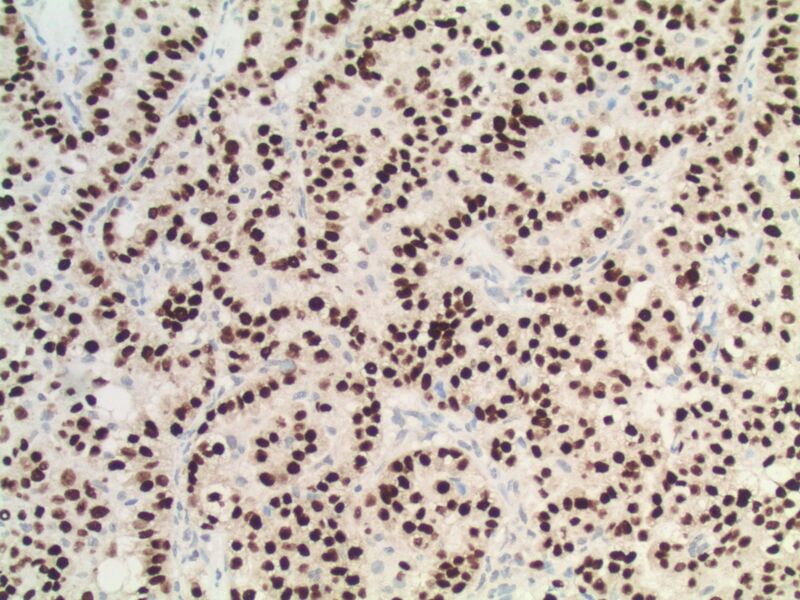 The FDA has recently approved another companion diagnostic for crizotinib, however: the IHC clone D5F3, which has shown a very high concordance with FISH testing. 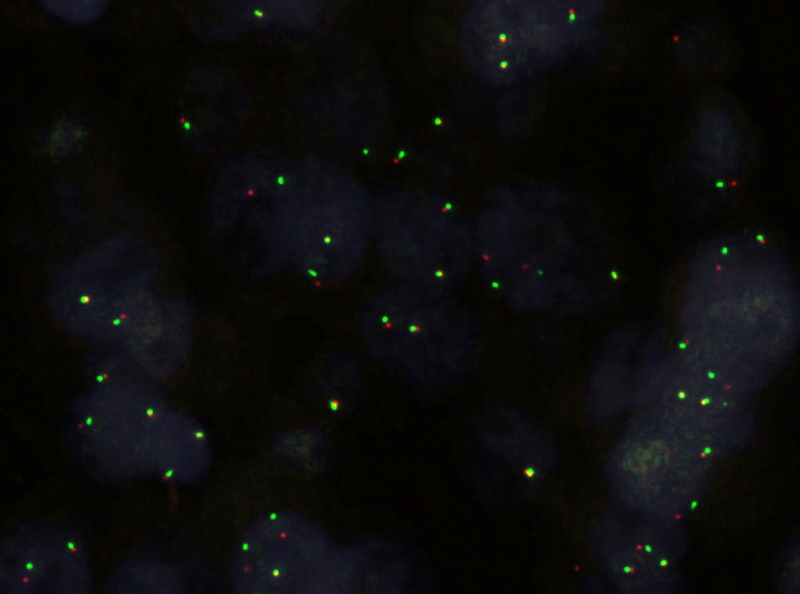 IHC has the advantage of being easier to perform, and possibly easier to interpret. Other IHC clones (e.g., 5A4), RT-PCR, and next generation sequencing can also identify ALK rearrangements (Clin Pharmacol Ther 2017;101:625) but may need confirmatory testing by an FDA approved method prior to therapy. It is uncertain whether ALK+ patients in general have a different prognosis compared to patients with other mutations because of conflicting retrospective studies and the quick adoption of ALK inhibitors. Targeted therapy with ALK inhibitors has been shown to significantly improve survival in ALK+ NSCLC patients when compared to traditional chemotherapy regimens. Crizotinib and the next generation ALK inhibitor ceritinib are recommended as first line therapy in advanced ALK+ NSCLC, according to the NCCN guidelines (NCCN guidelines version 5.2017). The median time to progression on crizotinib is approximately 7-12 months, and, based on early trials, may be as high as 18 months for ceritinib (Clin Pharmacol Ther 2017;101:625). However, patients become resistant to crizotinib after about a year (Clin Pharmacol Ther 2017;101:625). Ceritinib and alectinib, another next generation ALK inhibitor, have been shown to add a median progression-free survival (PFS) of 7-11 months after progression on crizotinib (NCCN guidelines version 5.2017). Other next generation ALK inhibitors are currently being studied in phase I/II trials (Clin Pharmacol Ther 2017;101:625). E. ALK+ NSCLC does not have any specific histologic features. 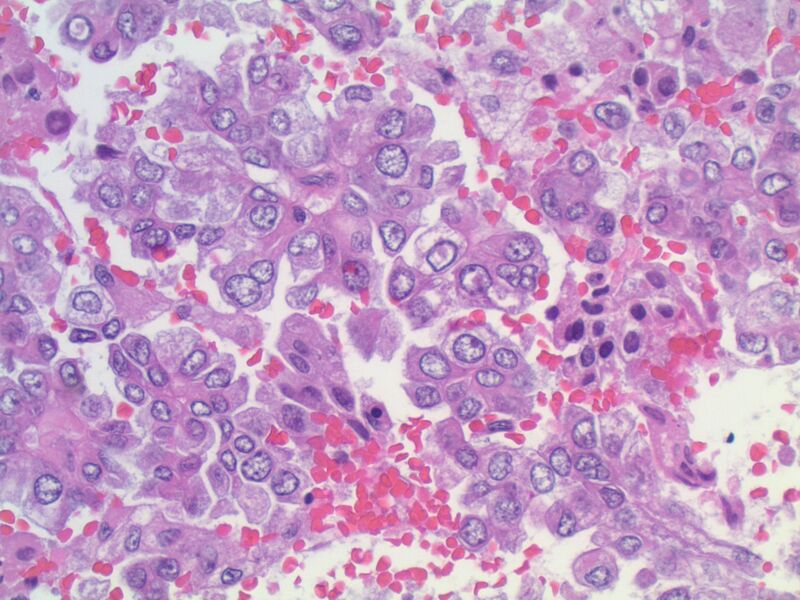 Although several features are common in ALK+ tumors, notably psammoma bodies and signet rings, there are no features that are entirely specific for this tumor type. As such, all subtypes of adenocarcinoma should be tested for ALK rearrangements per expert guidelines.